When the chambers of the Colorado Senate and House of Representatives were built in 1894, they were adorned with gold filigree stenciling over red and green paint, respectively, that was the work of Denver artist Manuel Hill. It’s hard to imagine now, but Hill’s beautiful work fell out of favor over the decades, and in 1954 the walls and ceilings of both chambers were covered in acoustic tiles in a décor scandal we now refer to as TileGate. The tiles were removed in 2013 and tested for lead and asbestos as part of a multiyear project to restore both chambers to their “historic and regal condition,” as former House Speaker Frank McNulty told The Denver Post. It was Speaker McNulty who unintentionally spearheaded the renovations. See, he wanted a tilted radiator in the House gallery fixed. And then, as it turned out, a peek behind the tiles wouldn’t hurt anything, either. After all, black and white photos of the stenciling had tantalized state architects, though no one knew what condition it was in. As the project commenced in 2013, and workers began peeling back the tiles, they were astonished by what they saw. 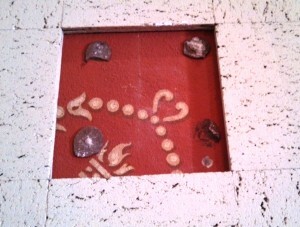 A photo of the original stenciling underneath the acoustic tiles in the Senate Chambers. Photo shared by Chief Clerk Marilyn Eddins. Thus began a huge renovation, funded by the Senate and House budgets and also the state’s capitol construction fund, which included painstakingly recreating the ornate stenciling and restoring the chandeliers in both chambers. Speaker McNulty would ultimately pass the project baton to his successor as House Speaker, Mark Ferrandino. On January 6th, more than a half century after it disappeared, the artistry hidden under those infamous acoustic tiles on the ceiling of the House of Representatives was again on display. That day, House Speaker Dickey Lee Hullinghorst officially declared the chamber open, and capitol staffers were invited to see not just the stenciled ceiling but also the restored chandelier in all its glory. Many of us walked the planks and braved the ceiling coffer (officially the “lay light space”) in the weeks prior to the reveal, both in the House and the Senate. Who recalls wondering if the scaffolding would really keep you from falling into the Well? (This writer does.) Both the coffer’s flat glass surface and the skylight in the roof above date to the 1890s. St. Louis Antique Lighting restored the immense House chandelier to its turn-of-the-20th-century glow. They recreated the top tiers and the top escutcheon plate based on photos and the original chandelier that is still in place in the Supreme Court Chambers. The Senate chandelier is due to be restored during the interim this year. Here is an incredible time-lapse film of the House of Representatives restoration process, courtesy of Rocket House Pictures, LLC. Replica “Edison” bulbs were installed at the perimeter and ceiling of the House in favor of the originals. Replacing the old cloth-wrapped wiring in the originals, to light them up once again, was simply one project too many. 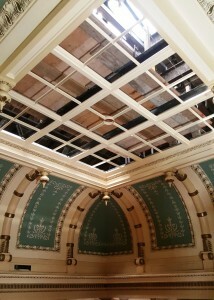 During the ceiling restoration process, it was discovered that prior to the most recent stencil pattern found, there was an earlier set of stencils and paintings. In the House, there were shields, eagles, and Greek or Roman profiles. In the Senate, similar profiles were found, as well as what appears to be a portrait of President Lincoln on the back east wall and another portrait on the back west wall. The west side portrait could not be identified due to the glue dobs (to hold the tiles in place) that had been placed over the face on the eyes. The Denver Art Museum brought in equipment used to look under paintings to help document the earlier stencils/paintings. State architect Lance Shepherd states that he believes the early stencils/paintings were installed just before legislators moved into the chambers and were meant to be temporary. Likely soon afterward, the stencils now seen in both chambers, and for which there is photographic documentation, were created. The recreated stenciling on the ceiling is based on photographs of the original design. A water-based paint was used all those years ago, probably to save money, and most of the ceiling stenciling had been washed away prior to the installation of the acoustic tiles. Our House of Representatives and Senate chambers surely are among the most beautiful working legislative spaces in the country, thanks to their restorers’ hard work and attention to detail. May we all work as diligently this session as they did during the interim! Author’s Note: Thanks to Lance Shepherd, manager of design and construction programs for the DPA’s Office of the State Architect, for his invaluable contributions to this article.